The ADMX files are updates on any computer that you have Internet Explorer 10 installed meaning that you can still edit the Internet Explorer 10 Administrative template setting from a Windows 7 and Server 2008 R2 computer if you also have the Group Policy Management Console Installed. However the Internet Explorer Group Policy preference are not as easily updated and you will still need to using a Windows 8/2012 computer to edit the IE 10 Preferences settings. 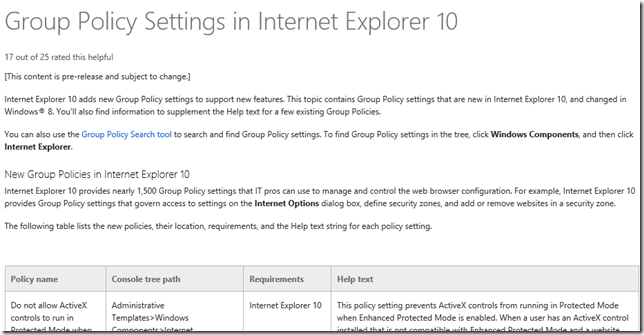 Update: I can confirm that the XML registry hack I previously posted at http://www.grouppolicy.biz/2011/03/how-to-enable-group-policy-preferences-support-for-ie9/ does still work with the IE 8 GPP setting if you set the MAX version to 11. However do this AT YOUR OWN RISK. ← Group Policy Search Engine has moved! We tried the way with GPO-Settings for IE 10 yesterday and today for more than 4 hours and more than 10 trys on a Remote Desktop Server (Windows Server 2012 – actually pateched). Everything with the GPO was fine, but the server didn’t accept the settings all the time. We than found the solution on another site and it worked – espacially i couldn’t stand, that the order to make this settings with gpo-editor would make any sense, but it will! Found a methode to do it with the GPO. It’s all about in which order you fill the proxy options. • Check “Use a proxy setting for…”. • Fill in your exceptions. • Check the “Use the same proxy for all protocols” button. • Fill in the IP and Port of your proxy server. In this order eveything is filled in. Only problem is that you never can go back to the Advanced.. screen. If you do so the proxy’s IP en Port will be cleared again. So the only way to add something to your exceptions is to make a ne w rule for IE10 in same order as written above. With my second try to come to this site, i wouldn’t get access this time; no idea why. I wanna thank the original author this way very much for the solution!